Silymarin (Silybum marianum), also known as Milk Thistle, is an herb that is well-documented in early traditional herbal medicine. 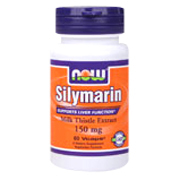 Studies abroad and in the U.S. have indicated that contituents in Silymarin may help to support healthy liver function. Other Ingredients: Cellulose (capsule), Rice Flour and Magnesium Stearate (vegetable source). Tumeric has been added to complement the effects of Milk Thistle Extract. Vegetarian Formula. Silymarin 150mg is shipped in a discrete, unmarked package. Orders are processed immediately and usually take about 3 to 5 working days to be received.. Any information received is used only for order processing and shipping purposes. Your information, such as e-mail address, will never be disclosed to a third party.